Zooby has just released their very first Mesh Avatar, and it is a cute lil’ cat! 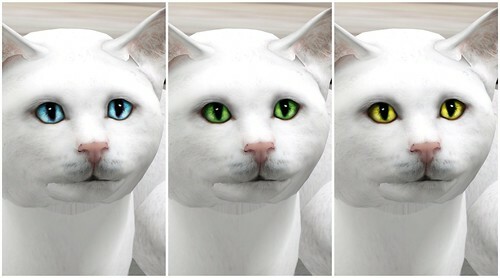 Each mesh cat avatar comes with a HUD to control eye colors, sounds, and movements. 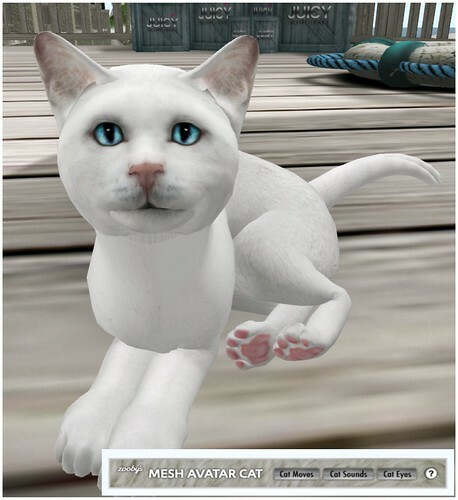 I wasn’t expecting this cat to be so realistic, but when I wore the avatar and the HUD, my avatar transformed into the most realistic cat I’ve seen in SL. The mesh sculpts combined with movements really made it come alive. I’m particularly fond of this White Mesh Cat — but you can also get Ginger and Black color. The Black cat would be so perfect for upcoming Halloween, and it’s such a cutie! The HUD lets you choose between 8 different movements — Nap, Clean, Walk, Run, Eat, Play, Sit, and Jump. Since this is a cat avatar that you wear, you won’t be able to rez this or cuddle it yourself. This cat avatar is perfect for role-playing a cat or being someone else’s cat. omygosh I want to be the orange kitty! Being someone else’s cat sounds fun. :p The only thing that’s missing is for the HUD to interact with other avatars so they can pet you or pick you up and hug you. I had thought from watching the video that it could interact with other avatars, but it didn’t. I am enjoying just pouncing around, though.